What is a Mindful Morning Routine? A mindful morning routine is a set of habits that you do each morning to help you get your day off to a good start. Its about consistently doing tiny things that build to create new habits that can help gain more clarity, feel calmer, and help you to manage stress more effectively. Why Is it So Hard To Create a Mindful Morning Routine That You Can Stick To? Perhaps you’ve tried to create a morning routine in the past and you only stuck to it for a week or two, and then it lost its appeal and you wondered why. I know in the past for me, I started many routines only to get bored or distracted and then I stop, even though they might have been doing me some good, I just couldn’t stick to it long enough to see the real deep benefits. I could never stick with a mindful morning routine because I didn’t have a big enough reason. That is, I hadn’t identified why I wanted to do. It really was simple. If you don’t know why you’re doing it, of course it’s gonna be a whole lot harder to stick to. I felt like I was always pressed for time. Adding more things to my already busy morning without adding extra time, was clearly a recipe for being unable to stick with a mindful morning routine long term. 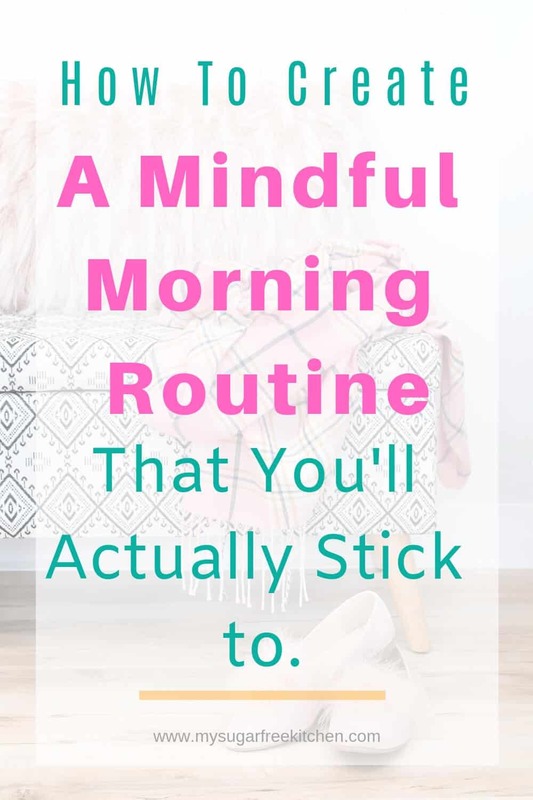 I overcome these issues by creating a simple Mindful Morning Routine that can be as short or as long as I want, depending on the time I have available, and I worked out my number one reason as to what motivated me to keep with it every day, even when I didn’t feel like it. Work out why having a Mindful Morning Routine is important to you. Are you committing to it to help manage your stress levels. Are you going to do it because it helps you to feel more clear headed. Are you doing it because it helps you to feel less anxious and more calm. Whatever it is, get clear on it up front because it is something you will need to remind yourself of on the days where you just can’t be bothered with your routine. 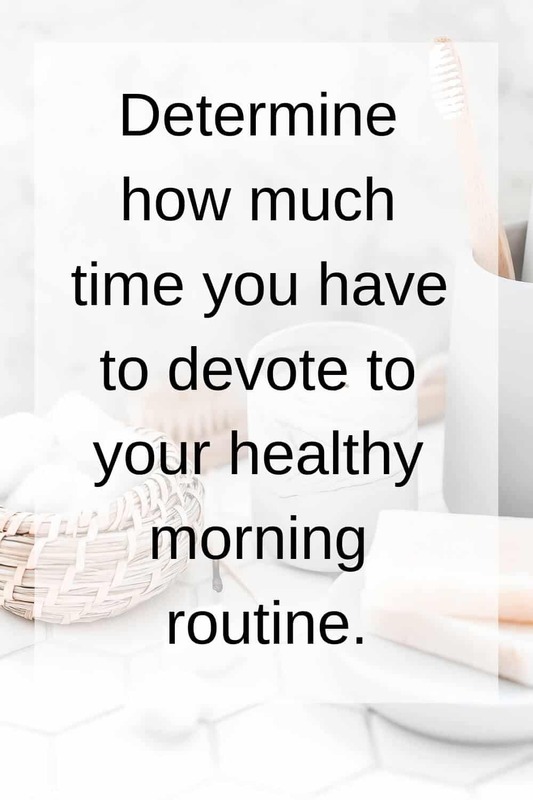 Determine how much time you have to devote to your healthy morning routine. Is it 10 minutes, 30 minutes, 5 minutes. Whatever it is, this is the amount of time you’ll have to get up earlier. If you’re not a morning person, start small with getting up an extra 5 minutes earlier. 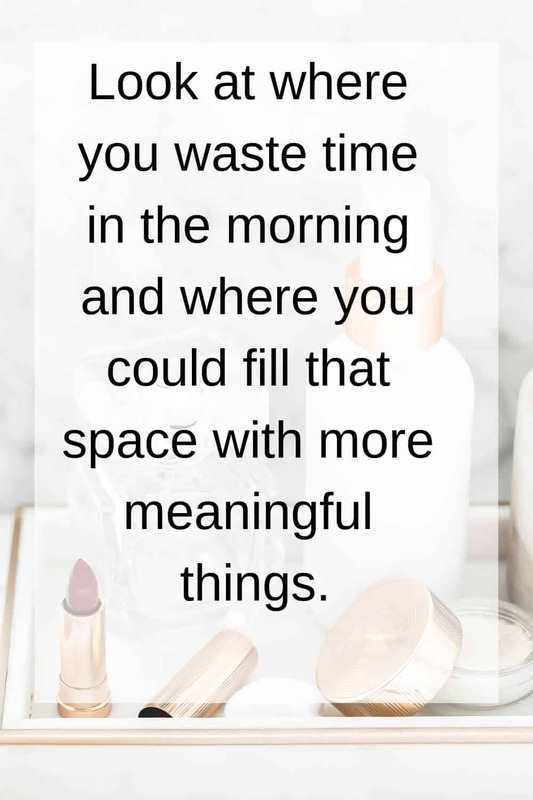 Look at where you waste time in the morning and where you could fill that space with more meaningful things. When I did this exercise I was shocked at how much time I just sat in the morning on the coach staring vacantly into space. I tied to tell myself that this was meaningful and purposeful, but really it was not. When I admitted this to myself, I got an extra 30 minutes back into my morning. When we’re sleeping we become dehydrated from lack of water. As soon as you wake, grab a glass of water and rehydrate your body. Yes, even before you make you coffee. A commitment to ignore all devices (phones, ipads, computers) before a certain time. These things do not add meaning to your morning and they will still be there later on. Decide from what time you will allow yourself to look at your phone, or check your email. Take a minutes silence. Yes a minute of silence can make a difference. Focus on our breathing, shut your eyes, and be still and silent for 60 seconds. It will help you to go into the new day feeling a little more relaxed and more connected to yourself. Being Grateful. I started doing this over a year ago and it has made a big difference. I personally have a gratitude journal where every day I write three things that I’m grateful for, either from the previous day, or just generally. If you’re not into writing, then say out loud three things that you’re grateful for. Actively looking for things to be grateful for tends to make us feel happier, and what a great way to start off the day. For me, gratitude journaling has been a game changer. Move Your Body. I am not a morning exerciser. I am strictly an afternoon exerciser. But I still make an effort to move my body in the morning. Some mornings I might have 5 minutes for exercise, others I might have 15 minutes, But I never miss it, and there have even times where I have only had one minute to devote to exercise, so I set my timer and did pushups for one minute and I felt a whole lot better for it. Moving in the morning gives your body that spark of energy to kickstart your day and that is a powerful thing. Connect with love ones. Say good morning, engage in conversation whilst you’re giving them your full attention, even if its just for a minute or two. These meaningful moments are so important to feed our soul and allow us to know that we are not alone. Go to my office, sit down at my desk, light a candle, set my timer for 1 minute. I close my eyes, put my hands in my lap, focus on my breathing, and have one minute of silence. I open my gratitude journal (an A5 blank notebook) an write 3 things I am grateful for. Some days they are very specific, some days they are general. Sometimes I repeat myself, sometimes, what I write surprises me. I write morning pages – three pages of unfiltered thoughts and ramblings into a lined journal. I find this to be enormously helpful in clearing my mind and to centre and balance me for the day. I roll out my yoga mat and my default movement activity is 10 minutes of yoga via the Down Dog app, which I love because you can choose a yoga workout based on the amount of time you have available as opposed to being in a 4 or 6 weekly course like come apps. If I don’t have 10 minutes for exercise (because maybe I have played with my dog longer than I anticipated), I’ll do 1 minute of pushups, 100 squats. I read a personal development book for 5 minutes. I’ve actually been surprised at how only reading for 5 minutes in the morning can get me through a book a month. Chat with my husband, go outside and get some fresh air and get ready for work. All in all, the routine above generally takes about 30 to 40 minutes, however when I have less time, I can do it in 15 minutes, and when I have more time I often stretch it out to 90 minutes. Your Express Mindful Morning Routine which is a super quick cut down version of all the difference pieces. This could be useful when your travelling, or on holiday for instance. Your Ultimate Mindful Morning Routine for weekends or when you have more time. I particularly like doing an ultimate routine when I’m facing a big decision, or have something challenging going on. 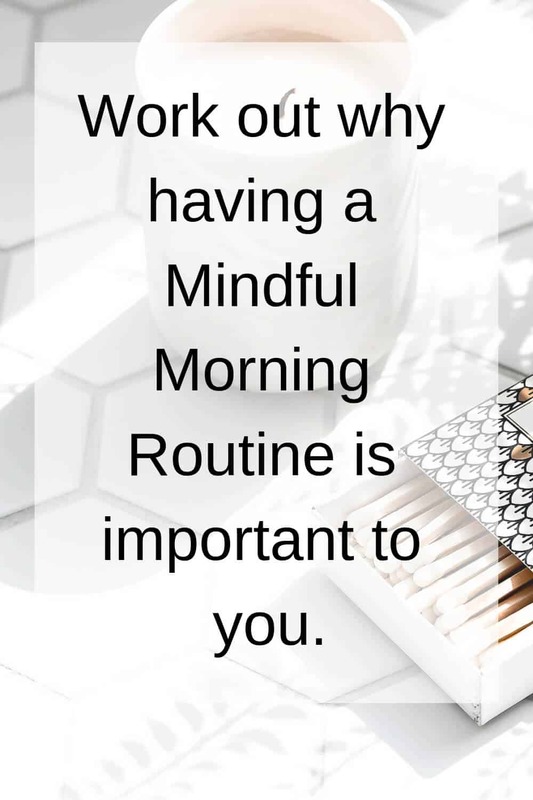 I seriously would be lost without my mindful morning routine and on the very very rare occasions where I miss it, I am not at my best and I know it. I’m scattered, frazzled and all other the place. This healthy morning routine is what keeps me sane in a sea of busyness and calm when there is chaos on around me. Plus I love the fact that its all mine. It really is the real deal when it comes to self care. 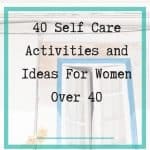 If you’re new to morning routines and self care, why not try the 30 day self care challenge. It’s free and I designed it especially for those of us who need more me time to relax, recharge and feel like the amazing person we know we want to be! 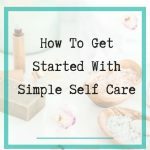 Join The 30 Day Self Care Challenge! Thanks for subscribing! 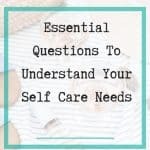 Please check your email to download the 30 Day Self Care Challenge PDF Printable Checklist.